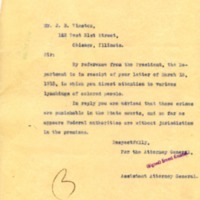 Acknowledging the receipt of Winston's letter regarding lynchings of African-Americans, the Assistant Attorney General advises him that the federal government does not have jurisdiction over these crimes. By reference from the President, the department is in receipt of your letter of March 13, 1915, in which you direct attention to various lynchings of colored people. In reply you are advised that these crimes are punishable in the State courts, and so far as appears Federal authorities are without jurisdiction in the premises. Knaebel, Ernest, “Ernest Knaebel to JB Winston,” 1915 March 18, LO31315c, Race and Segregation Collection, Woodrow Wilson Presidential Library & Museum, Staunton, Virginia.